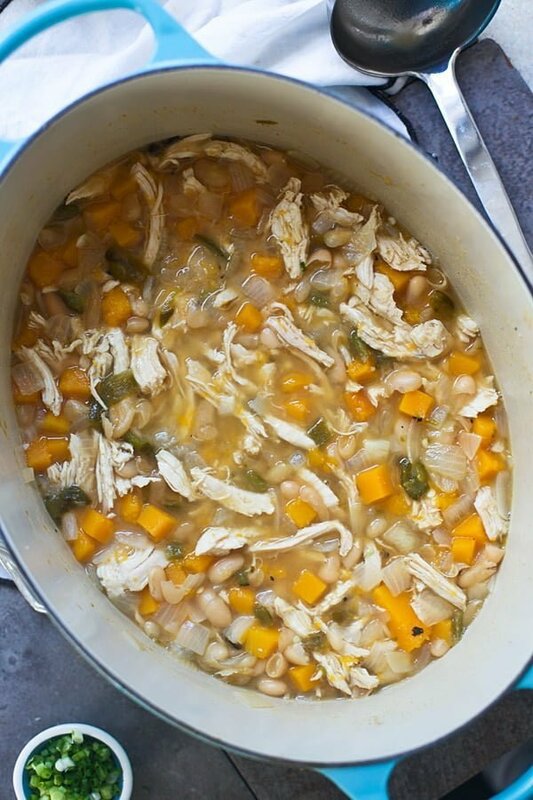 White Chicken Butternut and Poblano Chili, is a classic with an update! 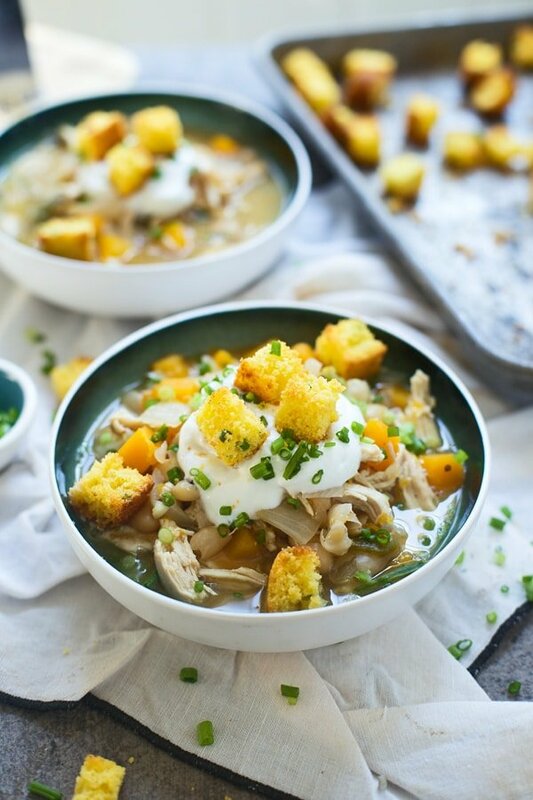 Smoky poblano peppers are added in for a spicy kick, diced butternut squash adds a sweet and healthy twist, and cornbread croutons make it just a bit indulgent! 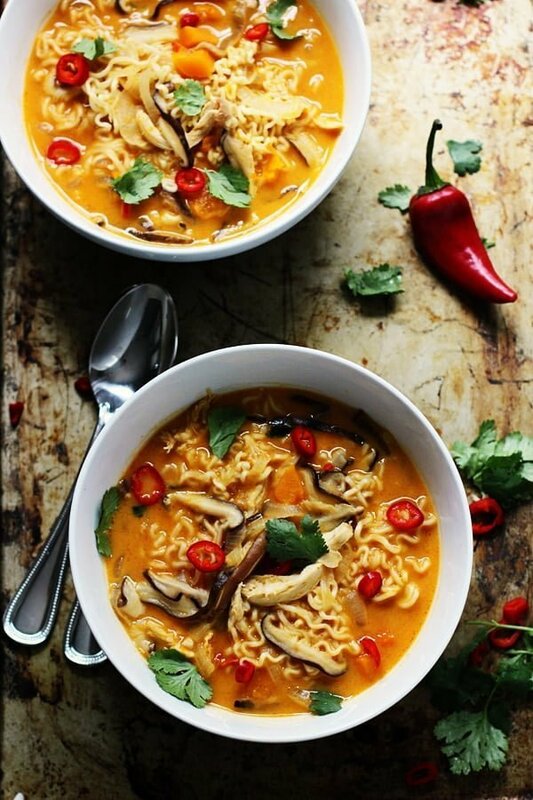 As an avid soup lover, I couldn’t be more thrilled that it’s finally acceptable to break out all my favorite warm-you-from-the-inside-out bowls of piping hot soup. Unlike a lot of people out there, I could actually eat soup any time of year – whether it’s a blistery 36 degrees, or a scorching 86 degrees (I’m crazy, I know.). However, I know the general population only deems it appropriate when there’s a slight chill in the air, so I demonstrated my upmost patience until the beginning of October, and now, it’s go time. Teddy has really taken to butternut squash lately, so while my first instinct was to whip up a batch of this curried carrot and coconut soup for my inaugural recipe, I wanted to make something that would be a sure-fire hit with the little guy as well. When a girlfriend of mine was talking about the white chicken chili she was having for dinner a week or so ago, it sounded so good, that I immediately began pondering ways to include Teddy’s favorite vegetable into the mix, and now, here we are. I’m sure you’ve seen renditions of white chicken chili all over the internet, and while this one does resemble a lot of those out there, there are a couple of notable differences. First, instead of using canned, chopped green chilies like a lot of recipes out there call for, I like to roast my own, peel the skin off, finely chop half of them, and then puree the rest to add to the soup. Although, because Teddy was a participant in the eating this time, I opted to skip the pureed part, so I could pick out the peppers if need be, but if you don’t have a 10-month old, I wouldn’t skip it, it adds a nice extra level of flavor that I love. Second, as aforementioned, I included fall’s most treasured vegetable, butternut squash. Not only does the squash complement the white beans, poblanos, and smoky cumin perfectly, but it makes the soup even more fall-worthy and healthy, which is always a plus in my book. 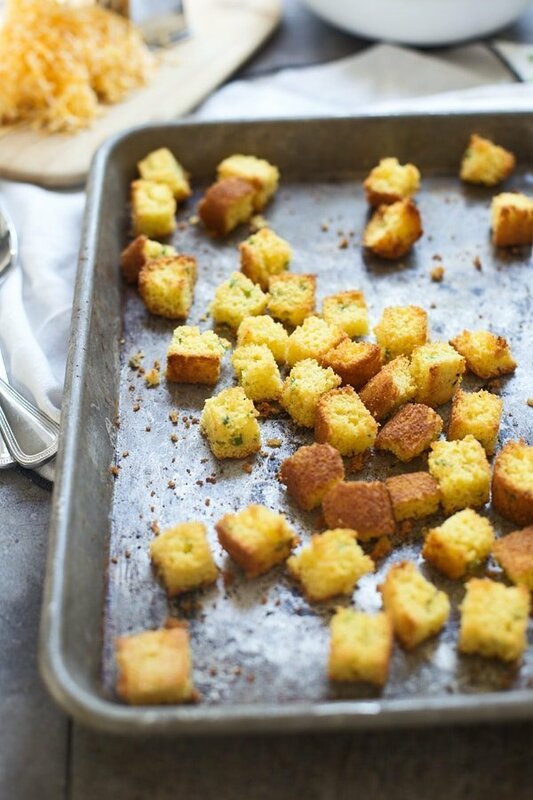 While the chili simmers and does its thing, you make….cornbread croutons. I’ve been absolutely OB-sessed with cornbread croutons for the last couple of years immediately after I had them in a house salad at a local restaurant here in KC. Life changing. 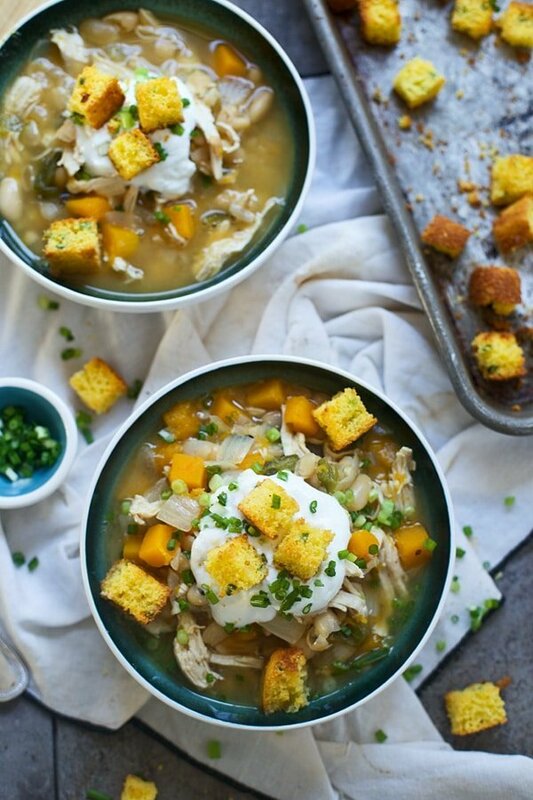 I’d never really thought of adding them in to my soups and stews, until this Pinch of Yum post where they sprinkled cornbread breadcrums on hot bowls of posole. Duh! Cornbread + chili = a million heart emojis. I know it may be tempting to skip the cornbread croutons since it seems like a lot of work, but luckily, cornbread is super easy to throw together (I’m talking less than five minutes), and you can actually make it ahead of time, and just pop the croutons in the oven while the soup simmers. Of course with chili comes toppings, so besides the homemade cornbread croutons, I like to pile my chili high with sour cream (or Greek yogurt), chopped green onions, and plenty of shredded cheese. Roast peppers over an open gas flame until charred on all sides. If you don't have a gas stove, preheat the oven to broil and roast on the very top rack. Turn until charred on all sides. Place peppers in a bowl, and cover with plastic wrap. Let sit for 5 minutes. Peel off skin, discard seeds and stems. Finely chop. In a large dutch oven or heavy pot, add butter. Turn the heat on medium and add butter, onion, garlic, and salt. Saute until fragrant, and translucent, about 2-3 minutes. Add squash and cumin, cook another 1-2 minutes. Add chicken stock and beans. Bring mixture to a boil, and reduce to a simmer. Add chicken. Cook until chicken is completely cooked through, about 12 minutes. Remove chicken from the pot, and use two forks to shred the meat. Use the same fork to slightly mash some of the squash and beans. Add the chicken back to the pot. Continue to simmer for 15 minutes. Serve with sour cream, cheese, green onion and cornbread croutons. Preheat oven to 400 degrees. Spray a loaf pan with non-stick cooking spray. In a medium bowl, whisk together cornmeal, flour, green onion, baking soda, salt, and sugar. In a liquid measuring cup, whisk together, milk, canola oil, and egg. Add wet ingredients to dry. Whisk just until combined. Pour into prepared baking dish. Bake until golden brown, and a toothpick comes out with just a few crumbs attached, about 20 minutes. Let cool for 10 minutes. 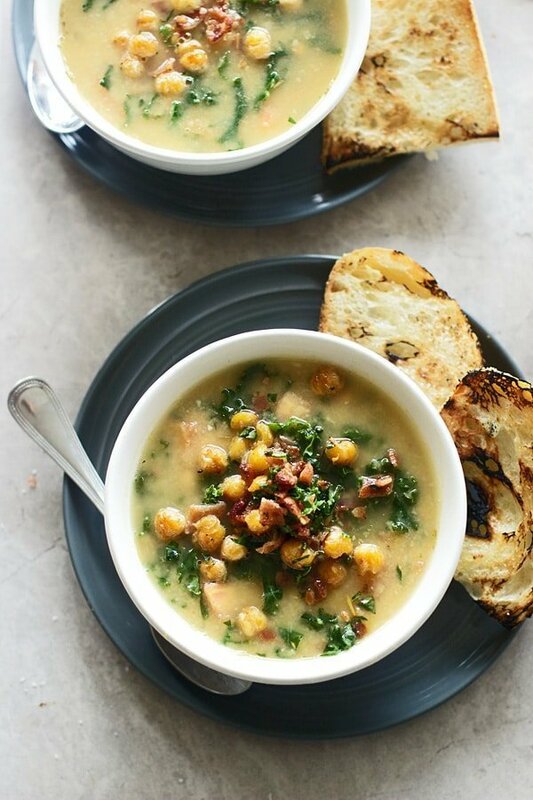 Check out these other awesome fall comfort soups! 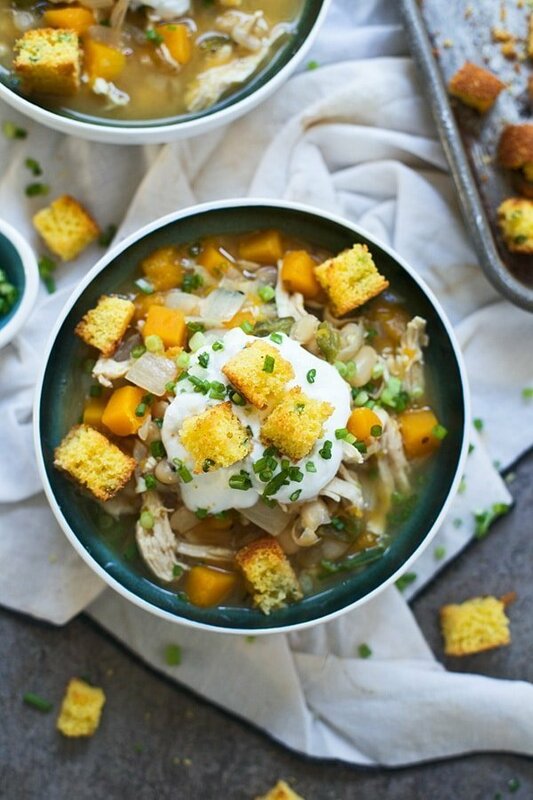 10 Responses to "White Chicken Butternut and Poblano Chili with Cornbread Croutons"
haha yup, I’m right there with you – I totally eat soup during the summer! But I love it even more now! This chili sounds SOOOO good! 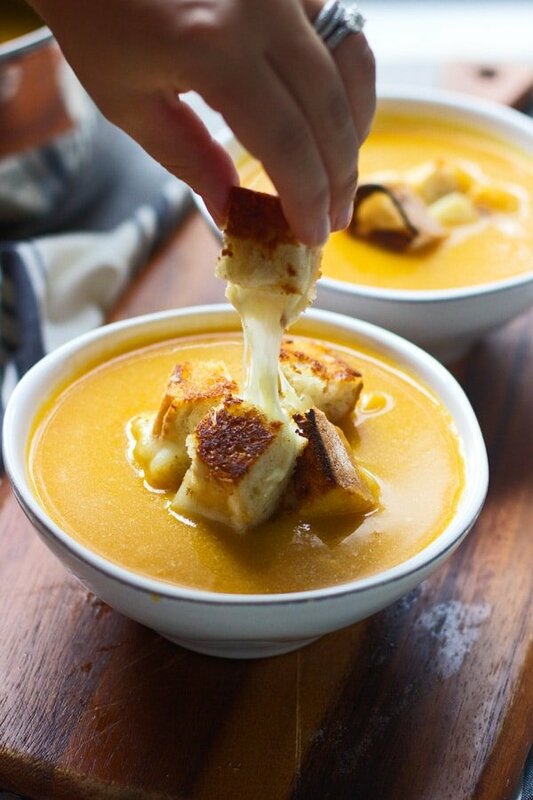 Whats soup weather? I eat soup year around even in the scorching hot dog days of summer. Love that you added fresh roasted poblano peppers. Glad I’m not the only one! Thanks Nicole! This chili sounds exactly like the dish I should use to bust out my soup/stew/chili cool weather recipes. The cornbread on top is so perfect! Do you cube the chicken or cook it whole in the soup? And when do you add back in the poblano?? So you put the whole chicken breast in, then when it’s done cooking, remove it and shred it. The chopped poblano peppers get thrown in with the beans and chicken stock!